For many years now Rushcliffe Borough Council has been supporting Notts Wildlife Trust in carrying out nature conservation related work around the Borough. Particularly in helping to set up and support Friends of Groups, wildlife education visits and running the successful Rushcliffe Nature Conservation Forum. In helping to fund this work Rushcliffe created a model that NWT would like to encourage all local councils to follow and indeed some have. As part of Service Level Agreement NWT produces an annual report of both its work funded by RBC, but also outlining its other work locally such a management of it`s own nature reserves, as well as the activities of the South Notts Local Group promoting an interest in wildlife and nature conservation. See the Out and About Wildlife walks section has now been updated with Rushcliffe wildlife related walks through to August 2017. Some are site visits, others are looking at specialist groups, all are led by local people with an interest and knowledge of our local wildlife. Click on the Diary Tab for more info. In Britain it grows mainly in the SW Midlands of England and most of the seasonal mistletoe harvest comes from traditional apple orchards – apple being mistletoe’s favourite host tree. Outside this area (and also within it) mistletoe’s other primary habitat is in gardens where it is usually planted on fruit, particularly apple trees. It also grows on many other trees including pear, lime, silver-birch even, however there is some evidence that it is a species specialist and so its seeds germinate more readily on the same species as the parent plant. It is a parasitic plant and is known as a hemiparasite as it still uses photosynthesis to create energy. Mistletoe supports a wide range of wildlife, some of which can be rare and adds value to the biodiversity of an area. 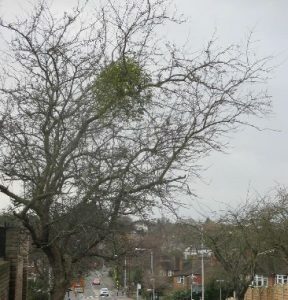 Winter is a particularly good time to spot it in the leafless trees and it has a characteristic appearance as illustrated by the photo of MISTLETOE IN WEST BRIDGFORD. WE know that Mistletoe grows in West Bridgford and Radcliffe on Trent, but the Rushcliffe Nature Conservation Strategy Implementation Group wants to find out how common it is in those areas and if it grows elsewhere in Rushcliffe. So if you suspect that Mistletoe is growing in a local tree, please let RNCSIG know by recording the location and tree type on www.surveymonkey.co.uk/r/R_mistletoe. ARE YOU A KNITTER ?